This last month, Zendesk employees in our San Francisco office participated in a ‘Month of Service’ where we had teams and individuals our volunteering every weekday of the month helping to make our neighborhood a better place. It was an opportunity to strengthen relationships and work together to improve our neighborhood. As an office, we completed 35 volunteer shifts throughout the month of April partnering with 13 organizations in our neighborhood. Collectively, we volunteered 730 hours participating in a variety of projects ranging from serving meals to taking seniors our for bicycling rides. We also had teams of all sizes prepare and serve meals at GLIDE for their lunch and dinner dining room shifts. GLIDE serves 2,000 meals per day to our community and as volunteers we assisted with everything from serving food, bussing tables, handing out silverware and being a friendly face as someone sits down to enjoy their meal. 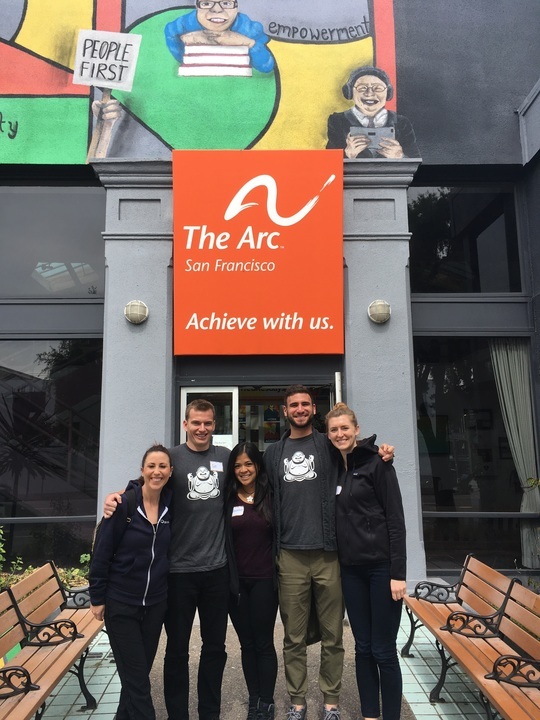 Our Velocity Sales team spent one morning helping out at the weekly art class at The Arc San Francisco. The Arc is a lifelong learning and achievement center for over 700 individuals with developmental disabilities. Working side by side on art projects while getting to chat with the clients was a highlight for this group! We wrapped up the month with a sunny Sunday in the Tenderloin for Sunday Streets. Sunday Streets is San Francisco’s very own open street program, inspired by the Ciclovía in Bogotá, Colombia, where we transform 1-4 miles of city streets into car-free spaces for community health and connection. Our booth featured bubbles, face-painting, jump ropes and sidewalk chalk art galore. It was a fabulous way to cap off the month! Our month of service helps us step out of our every day to deepen the connections with organizations and individuals making our community a better place. It allows us to build empathy for our neighbors and see that each person we are serving is are just like us, all while having fun doing it. If you are interested in volunteering with us, reach out to Kelly Salance - ksalance@zendesk.com. We strongly believe in the power of volunteering with our customers, community partners and neighbors as a way to bring us all together!